Motion, Mystique, and Elegance describe this new copper finished Delicate Leaves Spinner. 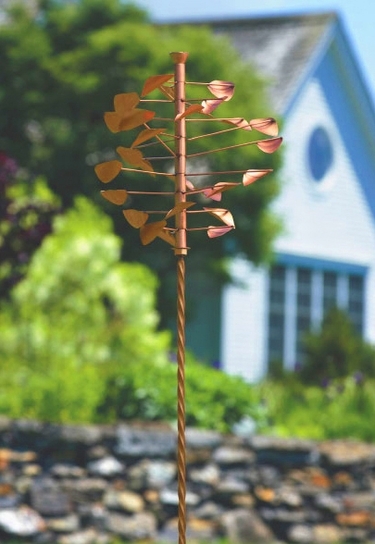 This Kinetic Wind Art Garden Disc Spinner stands with grace nearly five feet tall and peacefully creates motion with the wind. This Metal Spinner by Ancient Graffiti comes in a polished copper finish, and stakes firmly into the ground with a heavy-duty 7" pitched ground stake. With 27 leaves arranged in a triple cascading falling design, this double helix metal spinner stake is one of the few to spin in horizontal rotation. This precious wind art piece was not intended to be a speedy powered turbine where the beauty in design is completely lost in continuous blur. It is also not a flimsy cheap plastic wind toy twirler that spins like a rocket for a day and falls apart. This artfully crafted metal spinner has been designed with elegance and durability in mind, so that it truly showcases as garden art when standing perfectly still, and provides intrigue in motion as it easily catches the breeze. The entire spinner and twisted stake are finished thoroughly to withstand the elements and will age beautifully over time. To maintain the polished finish and prevent weathering, additional poly coats can be applied as desired. I remember taking a walk in my old neighborhood a few years ago and seeing this awesome item in someone's yard spinning ever so gently, just above a bush and between some trees. It was the first time I ever saw a high-end twirler like this and I thought it was simply breathtaking. The polished finish caught my eye and the motion kept me intrigued. I'm thrilled we are now carrying this product! 27 Leaves: 13" Height, 13" Spin Diameter. Total Height: 55"H above ground (62"H overall). Polished Copper Garden Stake Wind Art. Heavy Duty 7" Pitched Stake for added stability. Elegant Design when still or spinning in the wind. Weather resistant polished copper finish. A wonderful garden decor gift!